Human proteins whose subcellular locations were annotated has been extracted from special release of SWISSPROT database. All the proteins which were residing in more then one location, annotated as "isoforms", "potential", "probable", "by similarity" were filtered out. Further sequence redundancy was reduced such that none had >90% sequence identity to any other. Overall we were remained with 3780 proteins out of 10777, which were divided into 11 groups according to their subcellular localization as shown in the table. However, amount of data available for some gropus was too small for statistical analysis to be performed. Final data set consisted of a total of 3532 human proteins (840 CYTOPLASMIC, 315 MITOCHONDRIAL, 858 NUCLEAR, 1519 PLASMA MEMBRANE). In the present study, we have used SVMlight to predict the subcellular localization of human proteins. The software enables the users to define a number of parameters and also allows a choice of inbuilt kernel functions, including linear, RBF and polynomial. 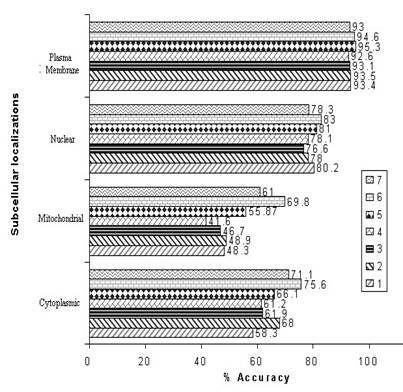 The prediction of subcellular localization is a multi-class classification. Here, the class number was equal to four for human proteins. The ith SVM was trained with all the samples in the ith class with positive labels and all other samples with negative labels. In this way, four SVMs were constructed for subcellular localization of proteins to nuclear, mitochondrial, cytoplasmic, and plasma membrane. An unknown sample was classified into the class that corresponded to the SVM with highest output score. where, x can be any subcellular location (cytoplasmic, mitochondrial, nuclear, or plasma membrane), exp(x) is the number of sequences observed in location x, p(x) is the number of correctly predicted sequences of location x, n(x) is the number of correctly predicted sequences not of location x, u(x) is the number of under predicted sequences and o(x) is the number of over-predicted sequences.